In the US, smallcap ETFs like IJR and IWM lagged badly in March, and they’re only up slightly over the last 12 months. Meanwhile, the Nasdaq 100 (QQQ) was up nearly 4% in March and is up 13.2% over the last 12 months. 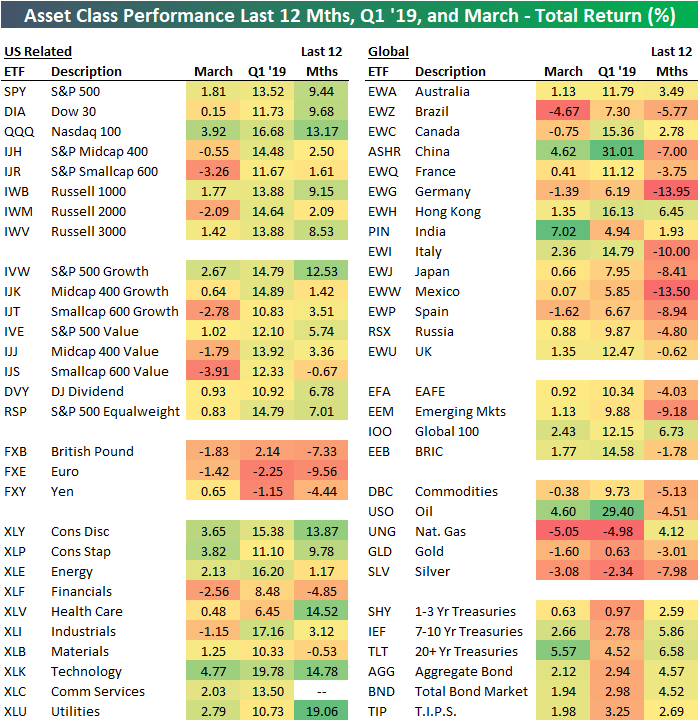 Germany (EWG) is down more than any other asset class over the one-year time frame. Below is a snapshot of total returns across asset classes using key ETFs traded on US exchanges. For each ETF, we show its total return over the last 12 months, year-to-date through Q1, and in March. In the US, smallcap ETFs like IJR and IWM lagged badly in March, and they're only up slightly over the last 12 months. Meanwhile, the Nasdaq 100 (NASDAQ:QQQ) was up nearly 4% in March and is up 13.2% over the last 12 months. You'll also notice that while most international equity market ETFs performed well in Q1, they're still mostly down over the last year. Germany (NYSEARCA:EWG) is down more than any other asset class over the one-year time frame. 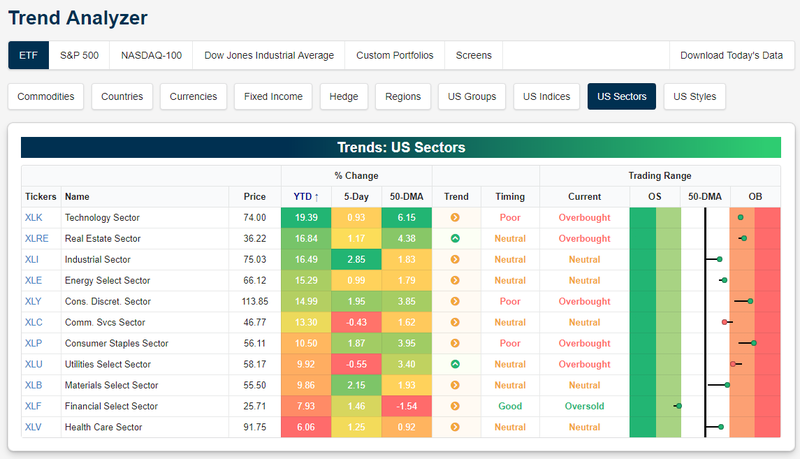 Below is a snapshot of US sector ETFs from our Trend Analyzer tool. The list is sorted by YTD performance from best to worst. Tech (NYSEARCA:XLK) led the way in Q1 with a price change of 19.39%. Real Estate (NYSEARCA:XLRE) ranked 2nd at +16.84%, followed closely by Industrials (NYSEARCA:XLI) at +16.49%. Financials (NYSEARCA:XLF) and Health Care (NYSEARCA:XLV) were the biggest laggards in Q1, but even these two sectors still gained more than 6%. Beauty company Coty (NYSE:COTY) was the top performing S&P 500 stock in Q1 with a gain of 75%. Chipotle (NYSE:CMG) ranked second at +64.5%, followed by Xerox (NYSE:XRX), Arista Networks (NYSE:ANET), and Xilinx (NASDAQ:XLNX). Who would have guessed that two of the top five performers in Q1 would start with an "X"! Other notable Q1 winners in the S&P 500 include Celgene (NASDAQ:CELG), General Electric (NYSE:GE), NVIDIA (NASDAQ:NVDA), Netflix (NASDAQ:NFLX), and Philip Morris International (NYSE:PM). 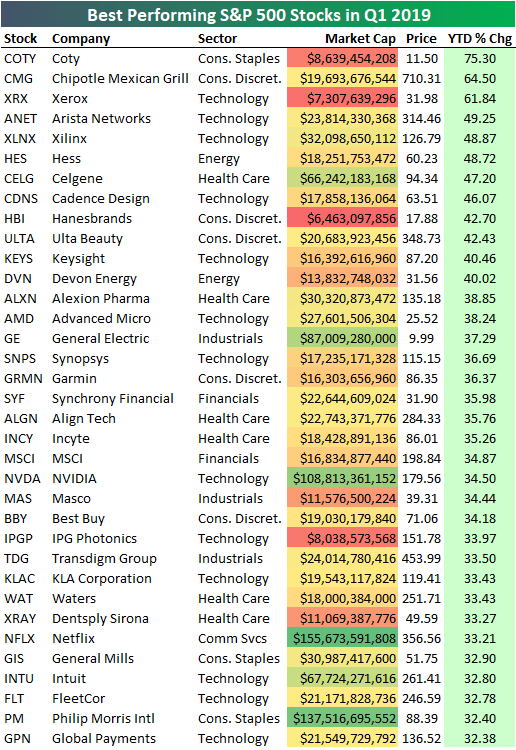 In the broader Russell 3,000 which comprises more than 98% of listed market cap in the US, there were 29 stocks that gained more than 100% in the first quarter. As shown below, Immune Design (NASDAQ:IMDZ) was the top performer with a gain of 350%, followed by Diebold Nixdorf (NYSE:DBD) at +344.58%. Constellation Pharma (NASDAQ:CNST) posted the third biggest Q1 gain at +237.91%, while Flotek Industries (NYSE:FTK) and Spark Therapeutics (NASDAQ:ONCE) round out the top five. 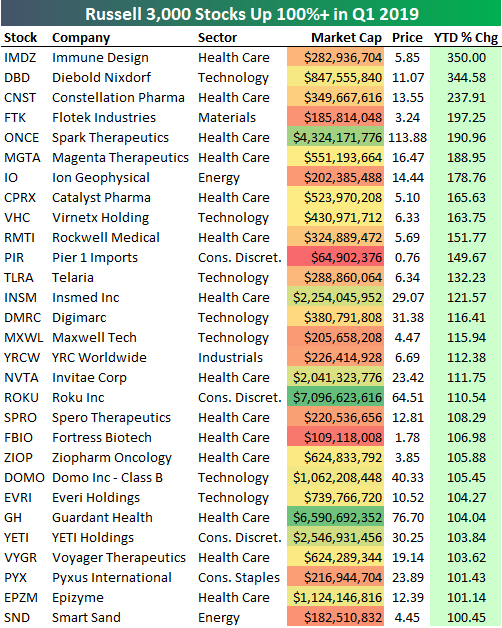 Other notables on the list of biggest Q1 winners include Insmed (NASDAQ:INSM), Roku (NASDAQ:ROKU), and YETI Holdings (NYSE:YETI).